In a rare public appearance, Thailand’s king has called for unity and stability in the divided nation during a speech to mark his 85th birthday. Vast crowds of devoted Thais turned out on Wednesday in Bangkok for a brief glimpse of King Bhumibol Adulyadej. Bhumibol sat on a throne on a balcony overlooking a plaza with a crowd that police estimated at 200,000 as he delivered a brief homily on national harmony. Most in the crowd were dressed in the royal colour of yellow, many waving Thai flags and flags adorned with the king’s insignia. 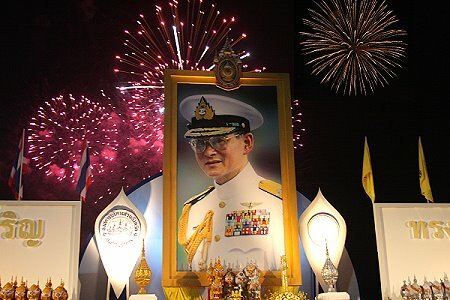 The turnout was a vivid demonstration of the affection in which many hold for Bhumibol, despite political turmoil in recent years that has raised doubts about the future of the monarchy. Bhumibol’s family flanked him for part of his appearance, including Crown Prince Vajiralongkorn, his son and heir-apparent. The king, who is seen as almost a demi-god by many in the politically turbulent nation, told the crowd that the “goodwill” Thais had shown by attending the ceremony together “gives me the confidence that your kindness is key to bringing unity to the people and the nation”. Chants of “Long live the king!” followed the royal motorcade as it made its way to and from the hospital where Bhumibol’ has lived for three years since suffering a respiratory illness in 2009.